Taking to the skies over Kent where the Battle of Britain was fought and won, in one of these beautiful 1930’s aircraft, is a once in a lifetime experience. 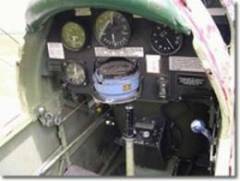 You will receive a full briefing and be provided with an authentic cloth helmet with intercom so that your instructor can guide you through all the aspects of flying in a vintage de Havilland Tiger Moth biplane. Then it's "chocks away" to experience a real piece of aviation history across the beautiful English countryside. The lucky recipient of this gift will have the opportunity to have a go at flying this classic vintage biplane under expert supervision. Loop the loop or barrel roll (not compulsory!) watched by family friends and rest assured that the instructor will be a high hour professional pilot with years of experience on the Tiger Moth. All online purchases are made through our secure server at aitsafe.com. G-ACDC is the third DH82a Tiger Moth built and the oldest still flying, it was registered on 6th February 1933 and was one of 10 allocated for use by the De Havilland School at Hatfield where it remained until November 1941. CDC was officially impressed into the R.A.F. as BB726 on 30th October 1940 and went first to No. 1 EFTS at Hatfield until November 1941 then moving onto No. 28 EFTS at Wolverhampton. It served out the rest of the war there, being retired to 9 MU at nearby Cosford on 21st July 1945. From Cosford it was re-issued to RAF Dyce on 9th June 1952 for the summer season and was again returned to store at 20 MU Aston Down in November 1952. The Tiger Club still has CDC's first post-war logbook. This includes a card showing it was Lot number 79 at a R.A.F. auction in 1953. In preparation for auction it was brought up to flying standard at R.A.F. Aston Down and signed off there in September 1953. CDC was purchased by A.J. Whittemore (Aeradio) Ltd who had it flown to Croydon where it went into storage. The civilian registration G-ACDC was officially restored on 4th December 1953. In July 1955 it was sold to locally based Continental Aircraft Services and a short while later moved on to Rollason Aircraft & Engines Ltd at Croydon. Rollasons converted CDC to civilian standards and at this time it had accumulated 4980 hours. During this overhaul the Tiger was completely stripped down and most of the structure was found to be sound though a new starboard upper wing was required and the antispin strakes, fitted by the military, were removed. CDC was then repainted to the old De Havilland colour scheme of maroon and silver and signed off on 24th June 1957 by Adrian "Dev" Deverill who was to look after her for the next 35 years. It was on the 6th September of that year that CDC suffered a minor mishap on take-off at Croydon and the starboard upper wing was replaced again. It seems that repairing Tiger Moths in those days was a quick job as she was flying again on 13th September. In October an unfortunate accident occurred when a Chipmunk taxied into CDC but the only repair required was a new rudder. During 1958 a new racing propeller was fitted and CDC was used until the early 60's for racing It won at least one race in the hands of David Phillips and was then converted back to the original specification. CDC then lived a busy life with general club flying and participating in the airshows that the Tiger Club was beginning to organise. The Tiger Club developed several other Tigers into racing Tigers, with modifications including moving the fuel tank into the front seat, to reduce drag. These Tigers were known as Super Tigers and included G-AOAA "The Deacon" and G-ANZZ "The Archbishop". It was during the Rochester Air display in September 1963 that CDC suffered her most serious accident. It was a very windy day and Neville Browning was trying to entertain the crowds with a crazy flying display, when he was caught by a strong gust. The aircraft completed several somersaults before coming to rest, luckily without injury to the pilot. After being recovered back to Rollasons, it was found to need all four wings to be replaced and the front fuselage and cockpit to be rebuilt. It was agreed at Dev's insistence that CDC would no longer be used for crazy flying, due to the historical value of this aircraft. The first Tiger, used by the Tiger Club for Standing on the Wing was G-ARAZ. The idea came from Lewis `Benjy' Benjamin in 1959 but obtaining approval from the Ministry of Aviation meant the first test flight, with a dummy, did not occur until February 1962. Rollasons made a dummy pilot and the trials were successful. Benjy of course was volunteered as the guinea pig and the first live flight was successfully carried out on 4th March 1962. This aircraft was used for some years and then the rig was passed on to CDC, which continues this tradition today. There has never been, surprisingly enough, any problem in finding volunteers to stand on the wing. Since those early days CDC has continued as the flagship of the Tiger Club and as its most popular aircraft. All new Club members want to have a record of it in their logbooks. CDC is also used for trial lessons and conversions onto Tigers. CDC has not been cleared by the C.A.A. for aerobatics because there are no antispin strakes, which seems a pity, as they were never required by De Havilland. CDC is still to be seen flying at Headcorn in her original maroon and silver colour scheme and has now accumulated over 13,000 hours.